French President Emmanuel Macron’s push for what he previously called “a real European army” got a big boost on Tuesday amid France and Germany signing an updated historic treaty reaffirming their close ties and commitment to support each other during a ceremony in the city of Aachen, a border town connected to Charlemagne and the Holy Roman Empire. But the timing for the renewal of the two countries’ 1963 post-war reconciliation accord is what’s most interesting, given both the rise of eurosceptic nationalism, the uncertainty of Brexit, and just as massive ‘Yellow Vests’ protests rage across France for a tenth week. Germany’s Angela Merkel agreed, adding in her own remarks: “We are doing this because we live in special times and because in these times we need resolute, distinct, clear, forward-looking answers.” The agreement, which is being described as sparse on specifics or detail, focuses on foreign policy and defense ties between Berlin and Paris. She clarified that the new military organization wouldn’t exist as a counterpart to or in competition with NATO, similar to prior comments she made before European parliament. Previously in November she had assured, “This is not an army against NATO, it can be a good complement to NATO.” This was also in support of Macron’s early November statements wherein he said of the proposed EU army, “We have to protect ourselves with respect to China, Russia and even the US” — words that were issued on the heels President Trump’s initial announcement that the US would withdraw from the Intermediate-Range Nuclear Forces Treaty (INF). Despite such such assurances analysts say the natural and long term by-product of a “real European army” — as Macron and Merkel suggesting — would be the slow eroding and demise of US power in the region, which would no doubt weaken the NATO alliance. The closest thing to a current “EU army” that does exist (if it can be called even that) – the Common Security and Defence Policy (CSDP) – is generally perceived as more of a civil and emergency response joint EU member mechanism that would be ineffectual under the threat of an actual military invasion or major event. So now we have combat ready armored vehicles with the EU flag which are being used against unarmed European protesters who are demonstrating against a pro EU authoritarian regime. As populists, we insist that one first takes care of one’s own country… We don’t want Macron to renovate his country with German money … The EU is deeply divided. A special Franco-German relationship will alienate us even further. 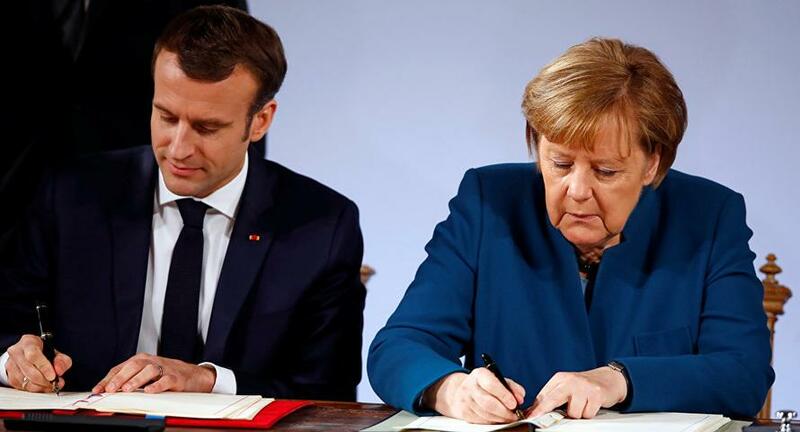 Also notable of Tuesday’s signing is that the Aachen document prioritizes Germany being eventually accepted as permanent member of the U.N. Security Council, which it mandates as a priority for French-German diplomacy. Such a future scenario on the security council would shift power significantly in favor of a western bloc of allies the US, Britain, and France, which Germany would vote alongside.